Denny Jump (Bellevue, WA, United States) on 13 January 2017 in Plant & Nature. On a chilly night with the full "Wolf Moon" shining down like a Hollywood Spotlight (I apologize for the bad exposure settings). these Mallards seem to be enjoying themselves. Beautiful view. Love the moon on the water. I noticed this moon here! Always fun to realize we all share it. It was golden and then later having risen, pearly and shining on the snow made everything look like morning, or mystical. Actually it woke me up at 2:30 a.m. Moon energy is strong. @Joyce: Hi Joyce!! Great to hear from you! I know, the moon was outrageous the past few nights! 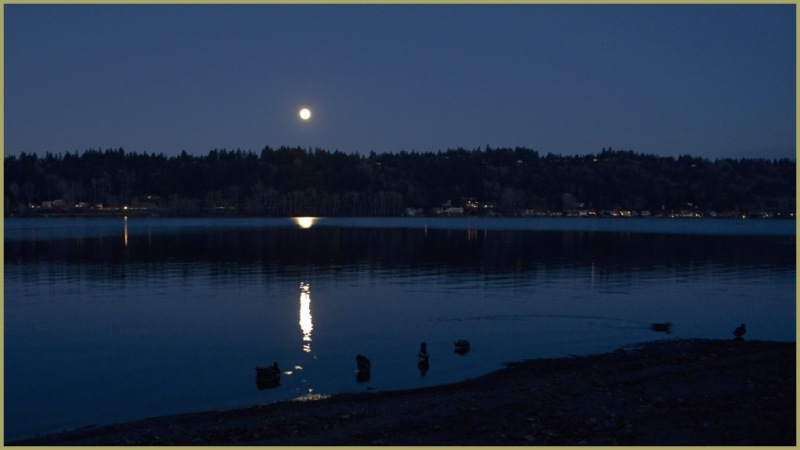 Here in the Seattle area, we are, often, lucky to even see the moon at all! Glad you are enjoying it as well! Cheers! The moonlight over the water here is wonderful. I also like the capture of the little light and reflection in the left of this picture. Hope you are well Denny. @Devi: Hi Devi- Thank you so much! @franz: Hi my friend! Thank you so much...There certainly was annemotional impact that I experienced at that moment ;-) cheers to you two! The moon is nice and bright. It was full last night. The mallards are quite happy I'm sure. Nothing wrong with a bit more subdued light - works the mood very nicely!